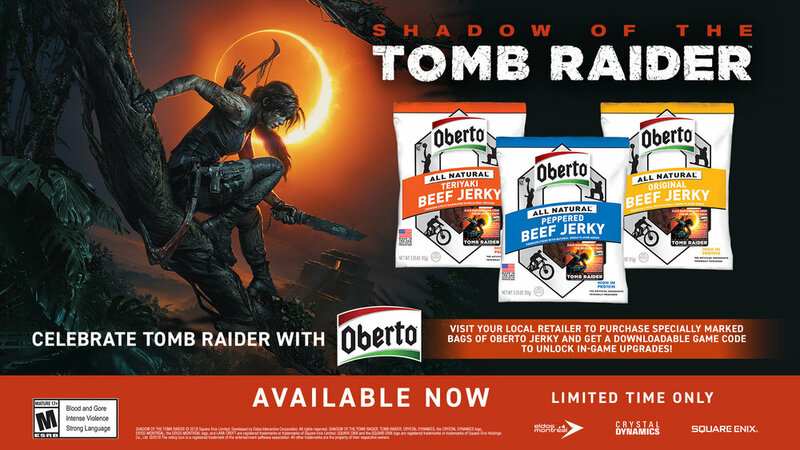 Oberto and Tomb Raider are teaming up to fuel your game experience with a downloadable game code inside specially marked Oberto products! The downloadable game code will be inside specially marked bags of Oberto’s 3.25oz Original, Teriyaki and Peppered beef jerky. BAGS OF OBERTO WITH THE TOMB RAIDER STICKER CONTAIN A DOWNLOADABLE GAME CODE TO UNLOCK IN-GAME UPGRADES. Once you obtain a code…. VISIT YOUR LOCAL RETAILER TO PURCHASE SPECIALLY MARKED BAGS OF OBERTO JERKY AND GET A DOWNLOADABLE GAME CODE TO UNLOCK IN-GAME UPGRADES.